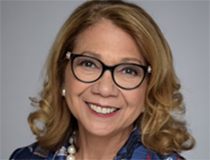 Mildred García, president of the American Association of State Colleges and Universities, will present “First Generation Student From the Presidency and Beyond” at 4 p.m. on Feb. 11 in the Burney Center as part of the 2018-19 Chancellor’s Distinguished Lecture Series. "This lecture series offers students an opportunity to learn more about leadership and success from experts who have excelled in their professional fields and who are committed to community outreach and civic engagement," said Chancellor Jose V. Sartarelli. "As president of AASCU, Mildred García is guiding national discussions about the future of higher education in the U.S."
As AASCU’s president, García is the first Latina to lead one of the six presidentially based higher education associations in Washington, D.C. Former President Barack Obama appointed her to serve on the president’s Advisory Commission on Educational Excellence for Hispanics. From 2012-18, she served as president of California State University, Fullerton. Under her leadership, she developed the university’s first ever five-year strategic plan and presided over the largest number of degrees ever awarded in a single year, as well as the largest enrollment in the university’s history. The Chancellor’s Distinguished Lecture Series brings executives, government officials and academic professionals to speak on topics related to the priorities outlined in UNCW’s Strategic Plan. Past speakers include David S. Congdon ’78, vice chairman and chief executive officer of Old Dominion Freight Line, and Huntley Garriott, Live Oak Bank president. The lectures are free and open to students, faculty, staff and the public, but registration is requested.